For all of you who have asked us for advice on feeding their pets, I wish we could. We are not experts in animal nutrition, so all we can talk about is what we do for our little muttlets! In short, we mainly feed raw and organic selections made from beef, chicken, turkey and occasionally bison. We buy from a local manufacturer, and keep it frozen until we’re ready to feed The Skids. First, no grains (wheat, barley, oats, corn, rice, etc. ), no potato or sweet potato. For carbs, add carrots and carrot peelings and fresh or fresh frozen apples. For meat, use everything left on the bird (chicken or turkey) except the bones. It takes a month or two to accumulate enough scraps from cooking, including complete chicken and turkey carcasses, with everything going into doggie bags in the freezer. Then, when the freezer is bursting at the seams, we thaw it all out and blend it together in the Cuisinart, supplementing a little fresh carrot, apple or spinach, as needed. I freeze it all in convenient meal-sized zipper baggies! There’s nothing in this blend but really tasty food, and The Skids go crazy for it! 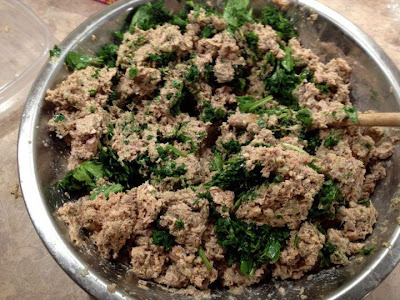 We supplement their “store-bought” raw meals with this very tasty treat. It’s fresh and wholesome, I know exactly what’s in it, and they thrive on it. But your dogs might be different. We are not soliciting comments on our choices, nor are we recommending that anyone else do this, but for those who have requested ideas, here’s one we enjoy doing for our furkids! Curious about what you're washing your dog with? These 3 dangerous chemicals might be harming your dog, not cleaning them.